Application class from which JavaFX applications extend. Note that the start method is abstract and must be overridden. The init and stop methods have concrete implementations that do nothing. The Application subclass must be declared public and must have a public no-argument constructor. Calling Platform.exit() is the preferred way to explicitly terminate a JavaFX Application. Directly calling System.exit(int) is an acceptable alternative, but doesn't allow the Application stop() method to run. A JavaFX Application should not attempt to use JavaFX after the FX toolkit has terminated or from a ShutdownHook, that is, after the stop() method returns or System.exit(int) is called. If the Application subclass is in a named module then that class must be accessible to the javafx.graphics module. Otherwise, an exception will be thrown when the application is launched. This means that in addition to the class itself being declared public, the module must export (or open) the containing package to at least the javafx.graphics module. Application parameters are available by calling the getParameters() method from the init() method, or any time after the init method has been called. JavaFX creates an application thread for running the application start method, processing input events, and running animation timelines. Creation of JavaFX Scene and Stage objects as well as modification of scene graph operations to live objects (those objects already attached to a scene) must be done on the JavaFX application thread. The Java launcher loads and initializes the specified Application class on the JavaFX Application Thread. If there is no main method in the Application class, or if the main method calls Application.launch(), then an instance of the Application is then constructed on the JavaFX Application Thread. The init method is called on the launcher thread, not on the JavaFX Application Thread. This means that an application must not construct a Scene or a Stage in the init method. An application may construct other JavaFX objects in the init method. All the unhandled exceptions on the JavaFX application thread that occur during event dispatching, running animation timelines, or any other code, are forwarded to the thread's uncaught exception handler. 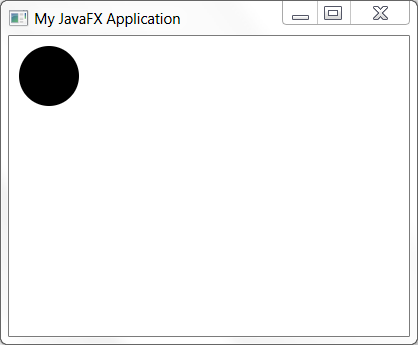 The following example will illustrate a simple JavaFX application. Encapsulates the set of parameters for an application. Constant for user agent stylesheet for the "Caspian" theme. Constant for user agent stylesheet for the "Modena" theme. Constructs a new Application instance. Gets the HostServices provider for this application. Retrieves the parameters for this Application, including any arguments passed on the command line and any parameters specified in a JNLP file for an applet or WebStart application. Get the user agent stylesheet used by the whole application. Notifies the preloader with an application-generated notification. Set the user agent stylesheet used by the whole application. The main entry point for all JavaFX applications. This method is called when the application should stop, and provides a convenient place to prepare for application exit and destroy resources. Constant for user agent stylesheet for the "Caspian" theme. Caspian is the theme that shipped as default in JavaFX 2.x. Constant for user agent stylesheet for the "Modena" theme. Modena is the default theme for JavaFX 8.x. Launch a standalone application. This method is typically called from the main method(). It must not be called more than once or an exception will be thrown. The launch method does not return until the application has exited, either via a call to Platform.exit or all of the application windows have been closed. The class specified by the appClass argument must be a public subclass of Application with a public no-argument constructor, in a package that is exported (or open) to at least the javafx.graphics module, or a RuntimeException will be thrown. where MyApp is a subclass of Application. appClass - the application class that is constructed and executed by the launcher. args - the command line arguments passed to the application. An application may get these parameters using the getParameters() method. IllegalStateException - if this method is called more than once. IllegalArgumentException - if appClass is not a subclass of Application. RuntimeException - if there is an error launching the JavaFX runtime, or if the application class cannot be constructed (e.g., if the class is not public or is not in an exported package), or if an Exception or Error is thrown by the Application constructor, init method, start method, or stop method. Launch a standalone application. This method is typically called from the main method(). It must not be called more than once or an exception will be thrown. This is equivalent to launch(TheClass.class, args) where TheClass is the immediately enclosing class of the method that called launch. It must be a public subclass of Application with a public no-argument constructor, in a package that is exported (or open) to at least the javafx.graphics module, or a RuntimeException will be thrown. The launch method does not return until the application has exited, either via a call to Platform.exit or all of the application windows have been closed. The application initialization method. This method is called immediately after the Application class is loaded and constructed. An application may override this method to perform initialization prior to the actual starting of the application. The implementation of this method provided by the Application class does nothing. NOTE: This method is not called on the JavaFX Application Thread. An application must not construct a Scene or a Stage in this method. An application may construct other JavaFX objects in this method. The main entry point for all JavaFX applications. The start method is called after the init method has returned, and after the system is ready for the application to begin running. NOTE: This method is called on the JavaFX Application Thread. primaryStage - the primary stage for this application, onto which the application scene can be set. The primary stage will be embedded in the browser if the application was launched as an applet. Applications may create other stages, if needed, but they will not be primary stages and will not be embedded in the browser. Gets the HostServices provider for this application. This provides the ability to get the code base and document base for this application, and to access the enclosing web page. NOTE: this method should not be called from the Application constructor, as it will return null. It may be called in the init() method or any time after that. the parameters for this Application, or null if called from the constructor. Notifies the preloader with an application-generated notification. Application code calls this method with a PreloaderNotification that is delivered to the Preloader.handleApplicationNotification method. This is primarily useful for cases where an application wants the preloader to show progress during a long application initialization step. NOTE: the notification will be delivered only to the preloader's handleApplicationNotification() method; this means, for example, that if this method is called with a ProgressNotification, that notification will not be delivered to the Preloader.handleProgressNotification method. Get the user agent stylesheet used by the whole application. This is used to provide default styling for all ui controls and other nodes. A value of null means the platform default stylesheet is being used. NOTE: This method must be called on the JavaFX Application Thread. The URL to the stylesheet as a String. Set the user agent stylesheet used by the whole application. This is used to provide default styling for all ui controls and other nodes. Each release of JavaFX may have a new default value for this so if you need to guarantee consistency you will need to call this method and choose what default you would like for your application. A value of null will restore the platform default stylesheet. This property can also be set on the command line with -Djavafx.userAgentStylesheetUrl=[URL] Setting it on the command line overrides anything set using this method in code. url - The URL to the stylesheet as a String.